The real question, of course, is: what's Lisa Loeb up to these days? No, you didn’t hit your head and wake up in 1994 — an independent artist has topped the Billboard Hot 100 for the first time in nearly 20 years, and for only the second time in history. Thanks to their brassy, bargain-hunting hit “Thrift Shop,” Seattle hip-hop duo Macklemore & Ryan Lewis join ’90s folk-pop singer Lisa Loeb in the elusive club of artists who reached number one without a label. Macklemore, born Ben Haggerty, has been recording music since the early 2000s, only began getting noticed this fall with the release of The Heist, his full-length debut album, recorded with production partner Ryan Lewis. Macklemore makes his strong feelings about big labels no secret on the album: In a song titled “Jimmy Iovine” — named for the chairman of Interscope-Geffen-A&M who helped make another white rapper, Eminem, famous — Macklemore takes down record contract politics with the unequivocal closing line, “I’d rather be a starving artist than succeed at getting f—-ed.” Geez, Mack, tell us how you really feel. It’s not all fun and games when it comes to popping tags, though. In a harsh critique, SPIN writer Brandon Soderberg claimed the song’s celebration of cheapness “stinks of privilege” and mischaracterizes rap music as excessively materialistic. 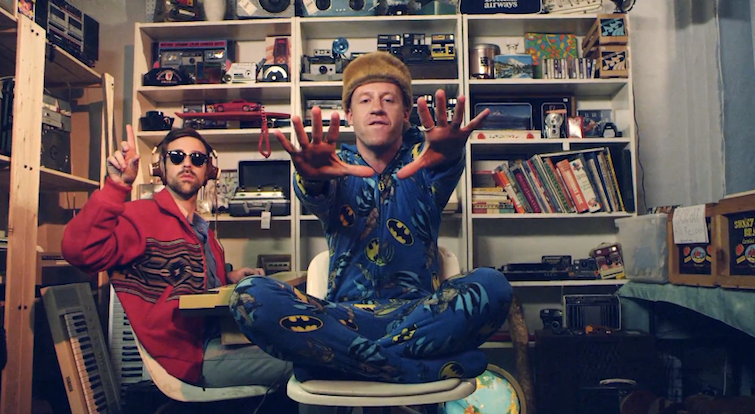 Macklemore is probably too busy frolicking in onesie pajamas to respond to his haters. The real question, of course, is: What is Lisa Loeb is up to these days? Since “Stay” launched her career, she’s released more than half a dozen albums, starred in a reality show about finding love (aptly titled Number 1 Single) and started a family. She’s about to release a new album, No Fairy Tale, early next month. As far as we know, though, the only hand-me-down onesies in Loeb’s life are the ones her young children are rocking.